elcome to the cureCADASIL Family Registry! CADASIL is a rare, genetic disease for which there are currently no effective therapies and no known cure. We hope that the cureCADASIL Family Registry will provide a forum for CADASIL patients and families from all over the world to share their personal experience with CADASIL. With your help, this registry will make CADASIL information accessible to researchers and to other registry participants who also share their information. There is so much the medical community can learn about CADASIL through information shared here by patients and families. As a registry participant, you will be able to take health surveys and see others experience with CADASIL. For example, you can access information to answer common questions such as "How many people experience migraines?" "Do others have difficulty swallowing?" In addition, participants may elect to receive information about clinical trials, research studies, and updates from the cureCADASIL Family Registry. Envision the cure. Embrace the challenge! 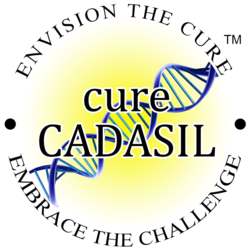 cureCADASIL Association is a non-profit 501(c)3 organization dedicated to CADASIL patients and their families. We aim to unite patients and the medical community in the pursuit of treatments and a cure for this rare genetic disease by promoting communication, advocacy, research, and education. We hope you will join the registry today! cureCADASIL Family Registry is fully compliant with the new European Union General Data Protection Regulation (GDPR), which became law on May 25, 2018.